I have made this recipe many times and I finally got a picture before the vultures, I mean my family devoured it! My friend Lynne, from 365 Days of Baking has some amazing recipes on her blog. I tried this recipe and loved it when she posted it almost 3 years ago, I know I have to catch up! I like the flavor of the chicken when it is marinated over night. The ginger flavor isn’t overpowering, it has a delicious flavor. Combine buttermilk, honey, ginger and garlic powder in a baking dish. Mix well. Add chicken to buttermilk mixture. Cover in plastic wrap and refrigerate for 2 hours or overnight. Combine panko, ginger, garlic, seasoned salt, and flour in a large bowl. 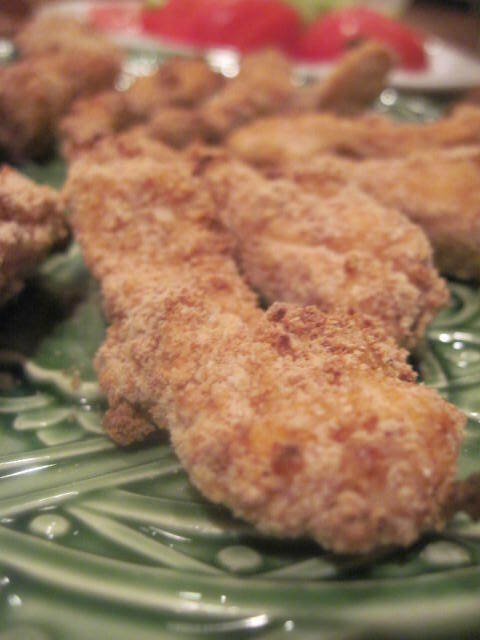 Toss chicken pieces in coating mix, making sure they are completely covered. Place chicken on a wire rack placed on a rimmed baking sheet. Continue with remaining chicken pieces. Spray each piece with cooking spray or olive oil. Turn each piece over and coat with cooking spray. Bake again for 10 – 15 minutes. Oh my goodness, Nettie!! How awesome!! Thanks for posting!! I’ve heard you time and time again say how much you love this recipe and I’m so glad. It makes me want to make it again soon, too! Mmmmm drooling! This looks amazing!! This looks and sounds very good. I am going to try the recipe this weekend instead of my usual recipe. It is nice to try new recipes. It keeps me inspired to cook .